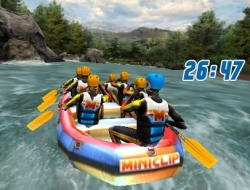 In this sports game you will venture of in wild adventures on the river. You are the captain of the boat and you must make sure that four of your crew members stay dry till the end of the race. Try to pedal your way through the red gates to earn points and duck if some obstacles are at head level. There will be small waterfalls every now and then so try to keep the boat steady as you pass them. If your time is good the team may reach the championship and even score a golden medal. Lead your team to victory and face the dangers together like true rowers on the white rivers. Use the arrow keys to pedal, and X to duck. White Water Rafting 0.00 between 0 and 10 based on 0 votes.